You sure do make a Leo like myself feel very appreciated. Thank you, lovely Geminian lady. Clark, It’s because you Leos always know how to make the rest of us feel good too! Actually, I’m a Pisces, but I do have a lot of Gemini in my chart as well as some Leo. 🙂 Quite frankly, we need ALL the signs to make the circle whole. Oh, wow, thank you! Why is it that many Pisces individuals have a lot of either Gemini or Aquarius in their charts? They’ve always been somewhat enigmatic and hard to read individuals. It was a fairly good article but it could’ve been better. Leo’s are more than just monarchs or dramatists. They’re also very physical a, dominant, extroverted, and powerful. They also have a fierce temper when provoked. In addition to actors and singers, they also make great athletes. Thanks for pointing out more of the salient features of Leo, Marrissa. You sound quite familiar with the sign! Oh. And although some astrologers this week Neptune is exalted in Leo, many others think it’s too watery and introverted and unrealistic a planet for Leo and instead have Leo be exalted in Pluto which admits Leo’s capacity for darkness and follows the old Sun myths about the sun gods going to the underworld. Pluto is better as Leo’s exaltation than Neptune. Well, that is one astrologer, Kathleen Burt, expressing Neptune in Leo’s exaltation. Quite frankly, the outer planets were never considered in these old classical rules of rulership, fall, exaltation, and detriment, so it’s still being debated by astrologers as to Pluto, Neptune, and Uranus’ roles. Many people see Pluto as a watery planet even though we know it is icy cold that far from the Sun. Lots of projection certainly is applied when working with these themes. The myths give us some clues, but WHEN the planets are discovered give us additional clues as to their meaning. Thanks! LOL…well, I should hope so. I am one and have taken some classes on Greco-Roman astrology. I’m studying to be a classicist. Oh, I see. Well that was traditional astrology before the outer planets were discovered and now that they’re discovered, they should keep in the spirit and essense of astrology which is balance and the signs that didn’t tradtionally have exaltations (Leo, Aquarius, and Scorpio) should be given the outer planets. Most astrologers already agree with Uranus for Scorpio so then Pluto should go to Leo and Neptune for Aquarius (the “Water-Bearer”). Thus, all the signs would be balanced again. Speaking of Neptune and, in a lesser degree, Leo. My natal chart states that I have a strong degree of the aspect Neptune square Sun. I then read about it on Astromatrix.com, an amazing website, and realized it was one of my biggest shortcomings. Paul—I would have to see your chart and its overall patterns and intricacies to answer this comprehensively, but Mr. Obama is a public example of this aspect. He is both admired and loathed as a public figure, but we do know he suffers from the ‘missing father’ which colors much of his psyche in this life. It means that you must find your own inner compass more or less as a mystic. Neptune is a call to something beyond the physical realm usually and only deep inner introspection and spiritual inner work really will satisfy. Artists often have this signature. I see it as spiritual strength once the incarnating soul has made some real sacrifices to live out their true purpose without looking to the world for validation. It is beyond anything the ego can bring and requires absolute trust in stillness where something vaster opens up and is known. Francis the Healer has it. I had a healing with him recently and he has an absolute trust in his inner voice and works tirelessly to help others. Remember, squares are challenges but yield strength once harnessed. Thanks again for your response, Genevieve! But I do think that the connection between Leo and Pluto (and Leo’s fiercer qualities and physicality) should be explored in the future! Marissa—Have you written about this anywhere? When Pluto was in the sign of Leo during WWII and thereafter we had a tremendous outpouring of creative power going forth to rebuild. I’m also struck by all the Pluto in Leo performers born during that time that have continued to hold forth well into this decade such as The Rolling Stones. The fierceness that you mention also for me translates into boldness and even audacity. Please share more. I’m intrigued by your comments! I’ve commented briefly on other sites about Leo and Pluto, but not extensively although another astrologer is letting me help them edit a section. And yes, I agree that creativity did expand when Pluto was in Leo, but also violence, war, and power (atomic bomb was invented in this time) and those qualities are also very Leonine. Sadly, in either an attempt to not offend Leos (like Scorpio’s reputation did with Scorpios) or because of the emphasis of the warmth and noble aspects, some modern astrologers forget that Leo has inherent ferocity and power as the lion and only natural predator of the Western Zodiac. It was also the only sign in ancient astrology that was characterized as both “bestial” (prefers primal instincts over higher reasoning) and fully “feral” (capable of savage and destructive behavior when angered). Leo can be either the creative star or the destructive black hole. 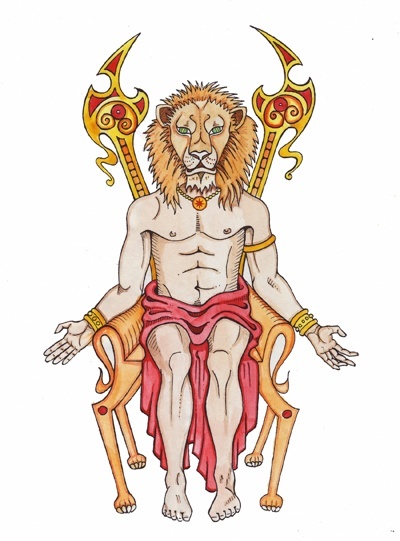 In fact, Leo’s origin as the Nemean Lion really speaks to his more destructive capabilities and why he’s regarded as Pluto’s exaltation by many astrologers. In one ancient version, the Nemean Lion was said to have dedicated the bones of all the people he slaughtered to Hades. So that’s why I hope that Leo’s more aggressive qualities are further explored in the wider astrological community as an inherent part of Leo’s character. Much like Scorpio’s “sting” is a part of it, and Aries’ and Taurus’ aggressive horns are part of them, so too are Leo’s ferocious teeth and claws part of its nature. Thanks for being so willing to chat and discuss these things with me! Thanks! And you’re very welcome! And yeah that’s true. I suppose Leo is usually a rather bright, kind, and charming personality. And I suppose most modern astrologers think highlighting our fiercer qualities will either offend Leos or give Leo a dark overall reputation like it did to Scorpio. But it’s the lion of the Zodiac and its only natural predator. And just like Scorpio’s stinger is an integral part of it, Leo’s claws and teeth are part of it too. By refusing or ignoring our fiercer and more powerful qualities, it makes us seem too “soft” and more similar to kittens rather than the mighty, fierce lions we are. Whoa! Really? That’s intense! And yeah, it sounds as though she did incorporate many of Leo’s negative traits (stubborn, dogmatic, fierce, overly dominant, tempermental). That’s tough. So sorry you and your husband had to go through that. Hopefully, things will be much smoother for you guys? Aw, thanks again. I’m so glad that you found my comments useful and I hope your readers will find it useful as well. Hi again Marrissa—–You know this sign well! Much appreciated that you are willing to share with us all the fuller, more comprehensive qualities of Leo. I personally love most of the Leos I’ve come in contact with, which is quite a few! They ARE bold and stylish I have found. They are also quite generous. I do feel they reward loyalty. I’ve also found that Leos often like to be with another Leo. At least I know two such couples in that category. Neither couple live together however. They each need to maintain their own den it would seem. What do you think on that subject Marrissa? Also, while Prahlad himself in some ways connect with Leo (although the sign itself is hardly “weak”), I find a much stronger connection in Vishnu’s avatar, Narasimha, who in trying to protect his follower, had to use his feral qualities and kill a demon! That’s more aligned with Leo than a little prince waiting around for someone else save him which isn’t Leo’s style. Interestingly, in a Shiva-based follow-up story, it’s said that after killing the demon, Narasimha was still so consumed with rage he kept rampaging and killing. Shiva sent two lieutenants to stop him but they were no match and finally Shiva himself had to take another form (part eagle, part human, and ironically, part lion) called Sharabha to subdue Narasimha, although Shiva worshippers refute this and regard it as another form of Vishnu. But although I still think that the best mythical portrayal of Leo is the original Greek Nemean Lion version because it highlights Leo’s incredible strength, near invincibility, and destructiveness (all of which modern astrology needs to do a better job of describing); one thing I really like about using Vedic portrayals is that often times the “good” characters and “bad” characters are one in the same. Although Shiva is usyally associated with destruction and Vishnu with sustaining and protecting the universe, BOTH Gods have aspects of compassion and ferocity. And indeed in actuality, both Gods (along with the creator God Brahma) are said to be themselves aspects of the ultimate one divinity, Brahman. So I can see all of this incorporated in Leo and in ways, in the entire Zodiac. I’m sorry that I didn’t post your comments sooner Marrissa! I got busy this January I admit. So thank you, again, for your contribution on my blog. The myths are fascinating, and you’ve ferreted out some excellent ones. Much appreciated!! No problem! I’ve had a lot on my plate too. But while I guess the whole “generous, bold, creative, warm, etc.” might seem to be compliments, I still find that they are too soft to properly describe Leo which is also a powerful, fierce, courageous, aggressive, passionate, and strong sign. These qualities should’ve been better explored in modern astrology which seems to try to tame Leo into this show kitty rather than accept it for the powerful creature it is: a mighty lion and nothing less. And yes, Leo’s do sometimes need our own space. This goes back to the old idea that we rule over forests and mountains and deserts which means we do love the outdoors and our alone time. So astrollogers get it wrong when they claim we constantly want attention. We are the warrior-kings and conquerors of the Zodiac. You’re very welcome and thanks again for being so open and understanding! Ah Marrissa!—–I like your style and verbalizing what you know as your own truth as a Leo. Funny, but I was just looking up Danielle Steel, that famous romance novelist. My husband used to know her as a client in San Francisco for many years. Sure enough; she has a stellium in Leo—Mercury, Pluto, Saturn, Venus, and Sun. Pow! She had SEVEN children on top of writing close to 200 novels. All that Leo in square to Jupiter in Scorpio no less. That is one driven Leo woman. Married 5 times too. I feel she’s a great example of what you are writing about. Her fixed pattern, of course, is that she is formulaic in her structure and never, ever writes about us common folks as she was born into wealth and created it. Even married the guy who owned the world’s biggest yacht; the Maltese Falcon. The grand-scale life of a ‘powerful, fierce, courageous, aggressive, passionate’ Leo. Thanks for stating that so clearly. Wow, that’s pretty awesome! Good for her…I guess? Although it’s a bit of a shame that she doesn’t write about common people though. But well, while that’s all great…material wealth wasn’t quite what I meant when I said Leo is powerful, fierce, aggressive, etc. I think I meant that physically, emotionally, mentally, and spiritually, Leos are strong. While we can be kind, just like lions, we don’t let people push us around. And that’s the side of us modern astrologers should emphasize. Hello again to you as well! Do people REALLY push Leos around? I’ve yet to see that in my circle of clients/friends. :). I do write about some pretty awesome Leos in my latest article and they are pretty much ‘self-made’ women. Yes, Danielle Steele was already born into privilege; you are right.